“The NOLA Sessions” is inspired by the beauty and creative depth of New Orleans. 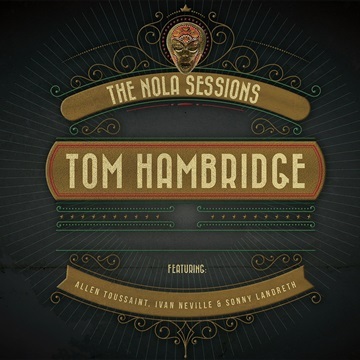 Tom Hambridge set out to produce a biographical blues recording by leveraging the immense talents of local musicians and legends including the late, great Allen Toussaint, Clapton's favorite slide guitarist, Sonny Landreth, and the B3 mastery of Ivan Neville, as well as rich artistic contributions drawn from New Orleans' musical heritage. For this eighth solo album Tom and his production team ventured south to The Parlor studios in the Irish Channel neighborhood of uptown New Orleans and gathered some of the best players the Big Easy has to offer. Other guests on this album of 13 original tunes by Hambridge, some in concert with other composers, include The McCrary Sisters and The Naughty Horns, as well as his daughters, Sarah & Rachel Hambridge. This quality production is further enhanced by being mastered at Abbey Road Studios in London in the “George Martin Suite” by Grammy winner Sean Magee.